Today I am launching the new Indigo Wholefoods online shop. This project has been a year in the making and I am very proud of the result. 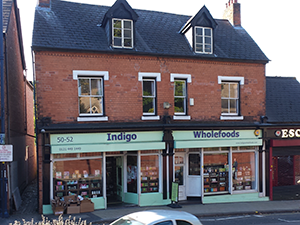 The online shop will provide customers with a new way of interacting with Indigo Wholefoods. It is feature packed and full of information about the shop and the products. You can also view the online shop on your mobile and tablet with our mobile optimised version of the online shop. All 2000+ products in-store are now online and available for collection in-store, local delivery or mail order*. Payments can be made on collection, by credit/debit card, paypal, telephone, bank transfer or for local delivery customers by direct debit. Like at Indigo Wholefoods there is a loyalty points program and discount days to take advantage of. You can now pre-order your organic fruit and vegetable boxes online. Choose between our large box for £13.00 and our small box for £6.65, select your options and preferences, tell us when you require the box and add to cart. The box will then be prepared to your specifications and be ready for collection or local delivery on your chosen day. You don't have to worry about buyng products online that are out of stock. Our in-store till system records all sales and sends details to the online shop, so the online shop knows exactly how many items we have in stock at any time. If an item goes out-of-stock the online shop will show this within a few seconds. If the product you require is out-of-stock you don't need to check back to see when it comes back into stock. Just enter your email in the box provided and we will email you as soon as the product is back in stock. You dont have to order the product online to take advantage of this feature. When the email arrives in your in box, pop down to the shop and buy the product off the shelf. If you really like a product, let other customers know about it. Follow the link on the product page to write your own reviews. From 1st September 2013 there will be changes to the delivery charges and other conditions for local delivery customers. There will be a £1 flat rate delivery charge for all deliveries within 3 miles of Indigo Wholefoods. Orders can be of any value. There will be a £2 flat rate delivery charge for all deliveries between 3 and 5 miles of Indigo Wholefoods. Orders can be of any value. Unfortunately, we are unable to deliver to addresses outside of 5 miles of Indigo Wholefoods. Deliveries can be on a Monday morning or a Friday morning. We apologize for any inconvenience these changes to charges and conditions may cause. To view a useful map to help you decide which delivery rate your address falls under and more information about our local deliveries please see the local delivery page on this website. Tree of Life are offering a 10% discount on two of their great events this June. To find out more about this event click here to visit the Tree of Life website. To take advantage of the 10% discount use the promotional code INDIGOTREE when purchasing tickets online before 17th May 2013.